I meditate on the incomparable Mahasaraswati who holds in her (eight) lotus-like hands bell, trident, plough, conch, mace, discus, bow and arrow; who is effulgent like destroyer of Sumbha and other asuras, who issued forth from Parvati's body and is the substratum of the three worlds. 1-2. Of yore Indra's (sovereignty) over the three worlds and his portions of the sacrifices were taken away by the asuras, Sumbha and Nisumbha, by force of their pride and strength. 3. The two, themselves, took over likewise, the offices of the sun, the moon, Kubera, Yama, and Varuna. 4. They themselves exercised Vayu's authority and Agni's duty. Deprived of their lordships and sovereignties, the devas were defeated. 5. Deprived of their functions and expelled by these two great asuras, all the devas thought of the invincible Devi. 7. Resolving thus, the devas went to Himavat, lord of the mountains, and there extolled the Devi, who is the illusive power of Vishnu. 8-9. 'Salutation to the Devi, to the Mahadevi. Salutation always to her who is ever auspicious. Salutation to her who is the primordial cause and the sustaining power. With attention, we have made obeisance to her. 10. 'Salutation to her who is terrible, to her who is eternal. Salutation to Gauri, the supporter(of the Universe). salutation always to her who's is of the form of the moon and moon-light and happiness itself. 11. 'We bow to her who is welfare; we make salutations to her who is prosperity and success. Salutation to the consort of Shiva who is herself the good fortune as well as misfortune of kings. 12. 'Salutations always to Durga who takes one across in difficulties, who is essence, who is the authority of everything; who is knowledge of discrimination and who is blue-black as also smoke-like in complexion. 13. 'We prostrate before her who is at once most gentle and most terrible; we salute her again and again. Salutation to her who is the support of the world. Salutation to the devi who is the form of volition. 14-16. 'Salutations again and again to the Devi who in all beings is called Vishnumaya. 32-34. 'Salutations again and again to the Devi who abides in all beings in the form of power. 78-80. 'Salutations again and again to her who, pervading the entire world, abides in the form of consciousness. 81. 'Invoked of yore by the devas for the sake of their desired object, and adored by the lord of the devas every day, may she, the Isvari, the source of all good, accomplish for us all auspicious things and put an end to our calamities! 83-84. O Prince, while the devas were thus engaged in praises and (other acts of adoration), Parvathi came there to bathe in the waters of the Ganga. 86. 'This hymn is addressed to me by the assembled devas set at naught by the asura Sumbha and routed in battle by Nisumbha. 87. Because that Ambika came out of Parvati's physical sheath (Kosa), she is glorified as Kaushiki in all the worlds. 88. After she had issued forth, Parvati became dark and was called Kalika and stationed on mount Himalaya. 89. Then, Canda, and Munda, two servants of Sumbha and Nisumbha, saw that Ambika (Kausiki) bearing a surpassingly charming form. 90. 'O King, a certain woman, most surpassingly beautiful, dwells there shedding lustre on mount Himalaya. 91. 'Such supreme beauty was never seen by any one anywhere. Ascertain who that Goddess is and take possession of her, O Lord of the asuras! 92. 'A gem among women, of exquisitely beautiful limbs, illuminating the quarters with her lustre there she is, O Lord of the daityas. You should see her. 93. 'O Lord, whatever jewels, precious stones, elephants, horses and others there are in the three worlds, they are all now in your house. 94. 'Airavata, gem among elephants, has been brought away from Indra and so also this Parijata tree and the horse Uccaihsravas. 95. 'Here stands in your courtyard the wonderful chariot yoked with swans, a wonderful gem (of its class). It has been brought here from Brahma to whom it originally belonged. 96. 'Here is the treasure named Mahapadma brought from the lord of wealth. And the ocean gave a garland named Kinjalkini made of unfading lotus flowers. 97. 'In your house stands the gold-showering umbrella of Varuna. And here is the excellent chariot that was formerly Prajapati's. 98. By you, O Lord, Death's shakti weapon named Utkrantida has been carried off. the noose of the ocean-king is among your brother's possessions. 99. 'Nishumbha has every kind of gem produced in the sea. Fire also gave you two garments which are purified by fire. 100. 'Thus, O Lord of asuras, all gems have been brought by you. Why this beautiful lady-jewel is not seized by you? 101-102. On hearing these words of Chanda and Munda, Sumbha sent the great asura Sugriva as messenger to the Devi. 104. He went there where the Devi was staying in a very beautiful spot on the mountain and spoke to her in fine and sweet words. 105-106. 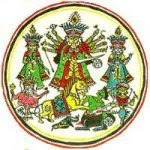 'O Devi, Sumbha, lord of asuras, is the supreme sovereign of three worlds. Sent by him as messenger, I have come here to your presence. 108. '(He says), "All the three worlds are mine and the devas are obedient to me. I enjoy all their hares in sacrifices separately. 109-110. "All the choicest gems in the three worlds are in my possession; and so is the gem of elephants, Airavata, the vehicle of the king of devas carried away be me. The devas themselves offered to me with salutations that gem of horses named Uccaisravas which arose at the churning of milk-ocean. 111. "O beautiful lady, whatever other rare objects there existed among the devas, the gandharvas and nagas are now with me. 113. "Take to me or to my younger brother Nisumbha of great prowess, O unsteady-eyed lady, for you are in truth a jewel. 115-116. Thus told, Durga the adorable and auspicious, by whom this universe is supported, then became serene and said. 117-118. You have spoken truth; nothing false has been uttered by you in this matter. Sumbha is indeed the sovereign of the three worlds an likewise is also Nisumbha. 119. 'But in this matter, how can that which has been promised be made false? Hear what promise I had made already out of foolishness. 120. "He who conquers me in battle, removes my pride and is my match is strength in the world shall be my husband." 122. 'O Devi, you are haughty. Talk not so before me. Which man in the three worlds will stand before Sumbha and Nisumbha? 124. 'All the devas verily cannot stand face to face with even the other asuras in battle. Why mention you, O Devi, a single woman? 125. 'Indra and all other devas could not stand in battle against Sumbha and other demons, how will you, a woman, face them? 127-128. 'Yes, it is; Sumbha is strong and so is Nisumbha exceedingly heroic! What can I do since there stands my ill-considered vow taken long ago? Here ends the fifth chapter called 'Devi's conversation with the messenger' of the Devi-mahatmya in Markandeya-purana during the period of Savarni, the Manu. 1-2. The messenger, filled with indignation on hearing the words the Devi, returned and related them in detail to the king of the daityas. 3-4. Then the asura monarch, enraged on hearing that report from his messenger, told Dhumralocana, a chieftain of the daityas: 'O Dhumralocana, hasten together with your army and fetch here by force that shrew, distressed when dragged by her hair. 6-7. Then the asura Dhuralocana, commanded thus by Sumbha, went forth quickly, accompanied by sixty thousand asuras. 8. On seeing the Devi stationed on the snowy mountain, he asked her aloud, 'Come to the presence of Sumbha and Nisumbha. 14. Then the great army of asuras became enraged and showered on Ambika sharp arrows, javelins, and axes. 15. Then the lion, vehicle of the Devi, shaking its mane in anger, and making the most terrific roar, fell on the army of the asuras. 16. Some asuras, it slaughtered with a blow of its fore paw, others with its mouth, and other great asuras, by treading over with its hind legs. 17. The lion, with its claws, tore out the hearts of some and severed heads with a blow of the paw. 18. And it severed arms and heads from others, and shaking its mane drank the blood from the hearts of others. 19. In a moment all that army was destroyed by that high-spirited and exceedingly enraged lion who bore the Devi. 22-23. 'O Chanda, O Munda, go there with large forces, and bring her here speedily, dragging her by her hair or binding her. But if you have any doubt about doing that, then let the asuras strike (her) in the fight with all their weapons. Here ends the sixth chapter called 'The Slaying of Dhumralocana' of Devi-mahatmya in Markandeya purana during the period of Savarni, the Manu.